LEGATO is a organisation which exists to strengthen the communication and cooperation between the gay and lesbian choruses in Europe. 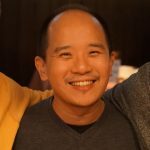 Fresh from their annual meeting, which was held in Munich, tenor Hsien reflects on the bonds which have brought so many European LGBT choirs – old and new – together. On the expedition of life it pays to stop now and then, and take stock of the forks and bends which have come before, so you know how you got to where you are, and perhaps what route to take in the future. As I sat for an enforced two hours of nothingness on the plane from Munich to London, I can’t help wondering what would have happened if I hadn’t joined the Pink Singers: would I even be aware of the wider community of LGBT choirs across Europe and the world? After this Legato meeting in Munich (7-9 Oct), I am incredibly thankful for the path my choral life has taken. 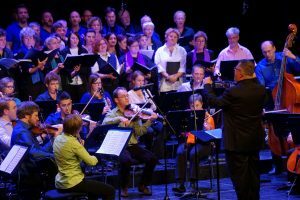 Legato, a slightly clunky acronym for “LEsbians and GAys singing TOgether”, is the umbrella organisation of Europe’s LGBT choirs, and a group the Pink Singers has been involved with since its inception. Legato helps to oversee “Various Voices” – affectionately abbreviated to “VV” – the four-yearly gathering of European LGBT choirs which the Pinkies have participated in virtually every iteration of, even back when it was originally called the European Lesbian & Gay Festival of Song. In fact, we have hosted this choral jamboree ourselves on a couple of occasions, our first being the fifth festival in the late 80s. Titled “Singing the Blues Away”, a deliberate dig at the Conservative party of the day, it took place at the height of Section 28, Thatcher’s pernicious anti-gay law. When the choirs of Legato saw that we needed their support to draw attention to that horrible piece of legislation, they awarded us the festival in 1989, helping us to put it on and standing with us in defiance against it. 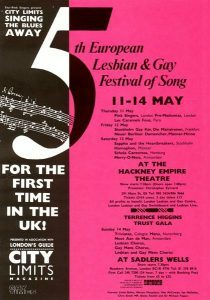 Section 28 was eventually consigned to the dustbin of history, but the Pink Singers will never forget the solidarity our European family showed us then. United we stand. The intervening decades have seen the winning of several victories for equality, so while there remains a lot to be done, the struggles we face locally do not seem as insurmountable as they used to. It is only natural that as a choral body, our emphasis has moved from responding to challenges, to enjoying our shared tradition of music making. Anyone who has ever been to a VV will be aware of the simple delights of participating in a weekend of singing with fellow choristers from across Europe. Although VVs only happen every four years, in between festivals delegates from our choirs meet at the annual Legato general meetings. 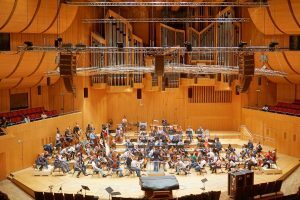 This year’s was an opportunity to view our backdrop for VV Munich 2018: the magnificent Gasteig. I can think of no better venue to celebrate LGBT choral singing that in this complex of four outstanding theatres, seating an audience nearly 4,000, surrounded by multiple shared spaces. The latter is actually much more important that it sounds because VVs are as much about socialising as they are about performance, and the communal spaces are essential to facilitate that. Brunch, with friends old and new. 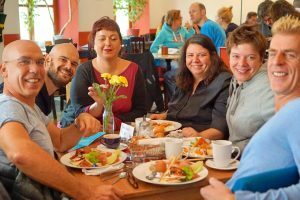 If VVs are principally opportunities to renew old friendships and make new ones, however, then the general meetings are concentrated versions thereof, and there were many new friends to be made this time round. In the last few years there has been an explosion of newly-formed LGBT choirs in Southern and Eastern Europe, and at this meeting they were present in force. Joining us in the north and west were representatives from Komos from Bologna, Roma Rainbow Choir from Rome, Checcoro from Milan, Coro Canone Inverso from Padua, the Mallorca Gay Men’s Chorus, Chór Voces Gaudiae from Warsaw, and the majority of the choir from Odessa, Qwerty Queer. In fact, among the many highlights of the BaVarious Voices concert, presented by the immensely talented Munich choirs on the Saturday night, was watching Qwerty Queer’s guest performance on stage. For me, hearing their song “Vertigo” sung in Russian, wrists bound in red ribbons which were symbolically thrown off, was not only a novel musical experience (I’m not sure we have ever heard Slavic songs at our festivals) it was a timely reminder that the support the Pink Singers once received is now needed in new places. The combined choirs and orchestra at BAVarious Voices. In a Europe, and a UK – which seems fixated on difference and is increasingly ready to put up barriers between us – it is perhaps time to stop and ask ourselves as both a choir and as a community who we are and how we got here, and perhaps then we can decide where and to whom the road runs from here on out. I hope it heads east and south towards our extended family there. This weekend in Munich reassured me of that. United we stand. Previous Previous post: Joining the Pinkies!